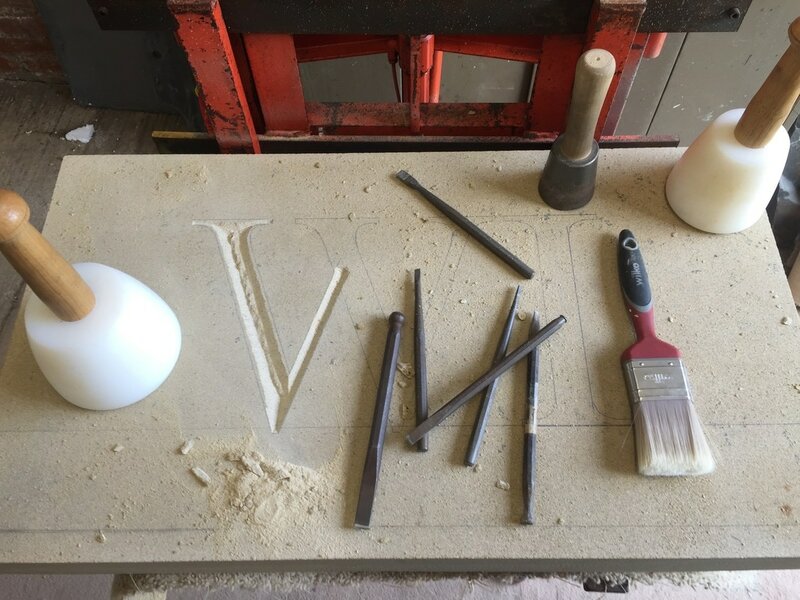 Francis Stone Design is the official letter carver for Sacred Stones Ltd. Stone carver Louis is working in conjunction with Sacred Stones as a lettering carver on their most recent project, Willow Row and will be undertaking the personalisation of the memorial stone façades. 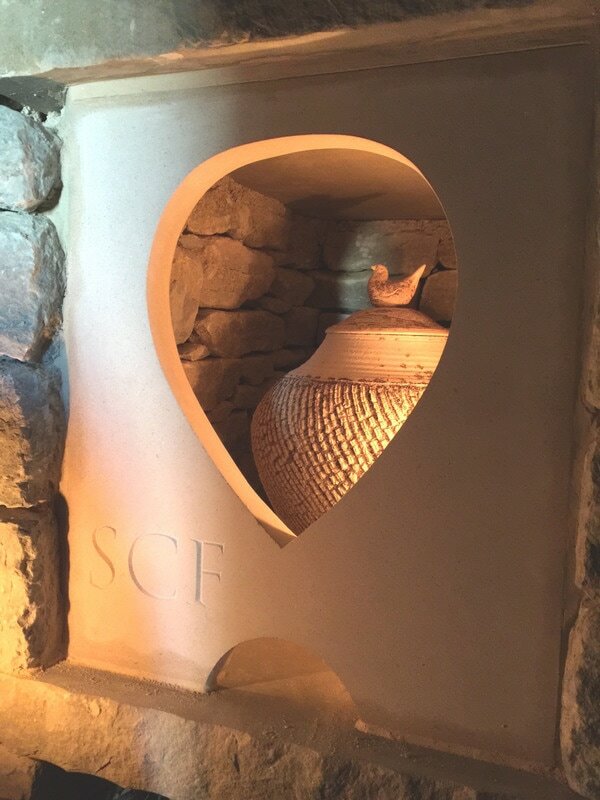 Sacred Stones is a private memorial company based in Bedfordshire, and creates resting places for cremation ashes. 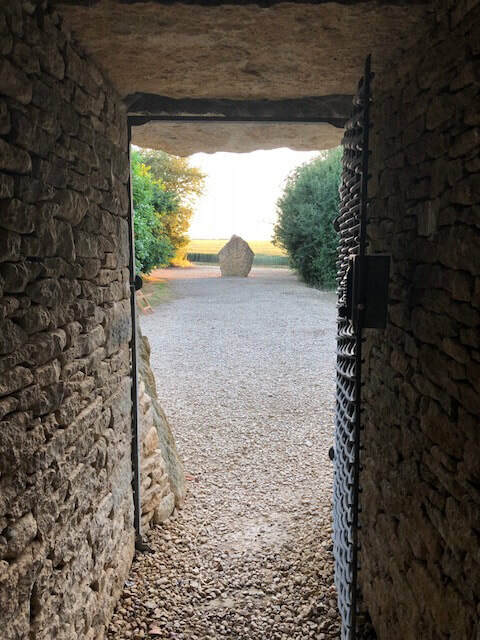 Inspired by the ancient burial mounds of our prehistoric ancestors, Sacred Stones provide a wonderfully natural alternative to modern day memorials and cemeteries. Sacred Stones was formed in 2014 by Toby Angel, Mark Davis, Martin Fildes and Geraint Davies. 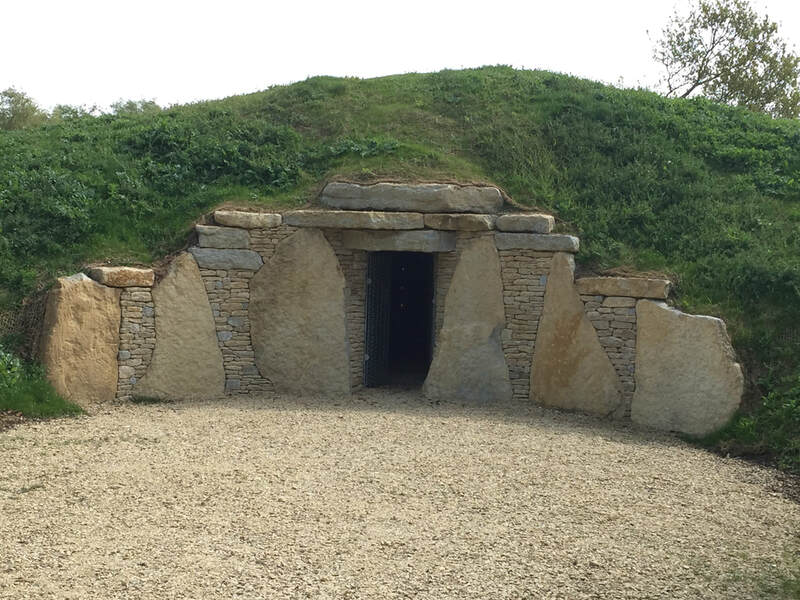 Martin and Geraint were responsible for designing and building The Long Barrow at All Cannings Wiltshire, the first long barrow in circa 5,000 years. What is a Sacred Stones barrow like? Stepping inside the barrow a stillness descends. 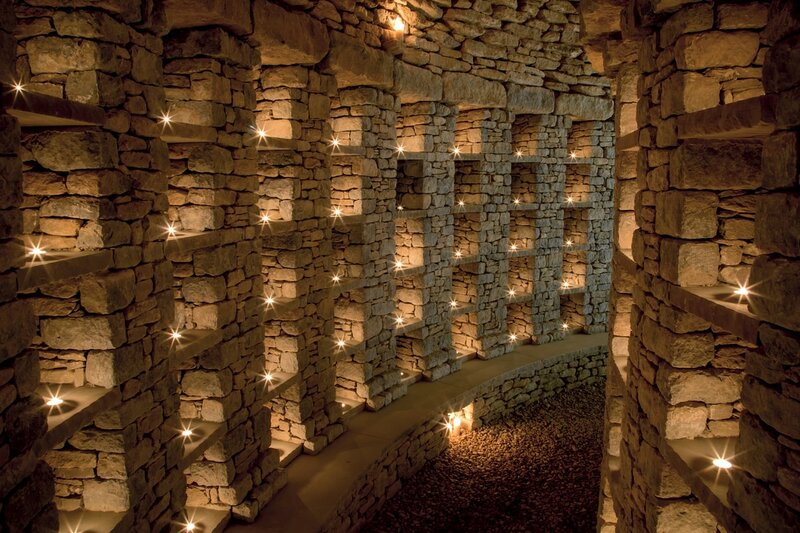 Niches line the walls, a central passageway bisects the circular chamber which is illuminated by candles to bring a warm and natural radiance to the interior. 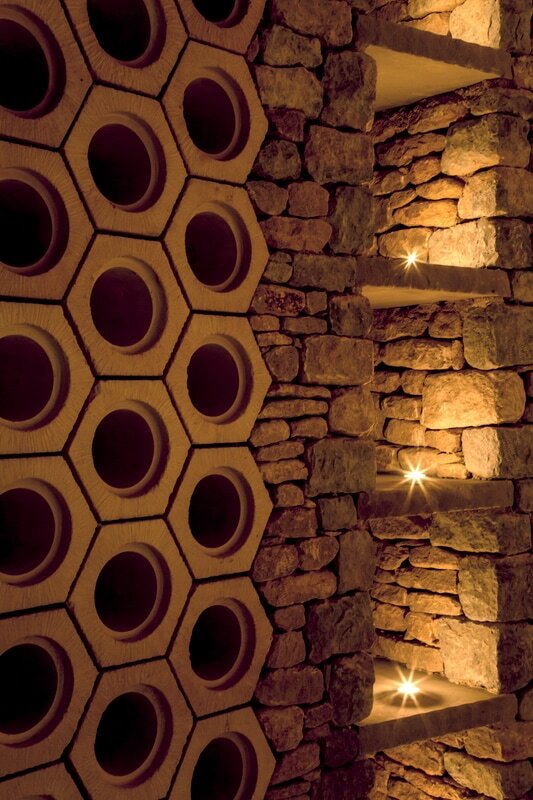 The dressed limestone walls reach up to stone lintels which support the striking beehive-shaped corbelled roof above. Outside, the insulating, protective earthen roof ensures that inside everything is dry, peaceful and quiet, as befits a final resting place. Upon leaving the inner sanctuary of the mound, stone rests, thoughtfully placed by the stonemason amongst the trees and shrubs, allow people to sit, talk and eat together, just as our ancestors would have done. Willow Row Barrow nestles next to the village of Hail Weston, near St Neots, and is Sacred Stones’ flagship barrow. Named after the willow trees that fringe the nearby brook, it is a haven for shrubs, hazel trees and wildlife - the perfect place for quiet reflection. 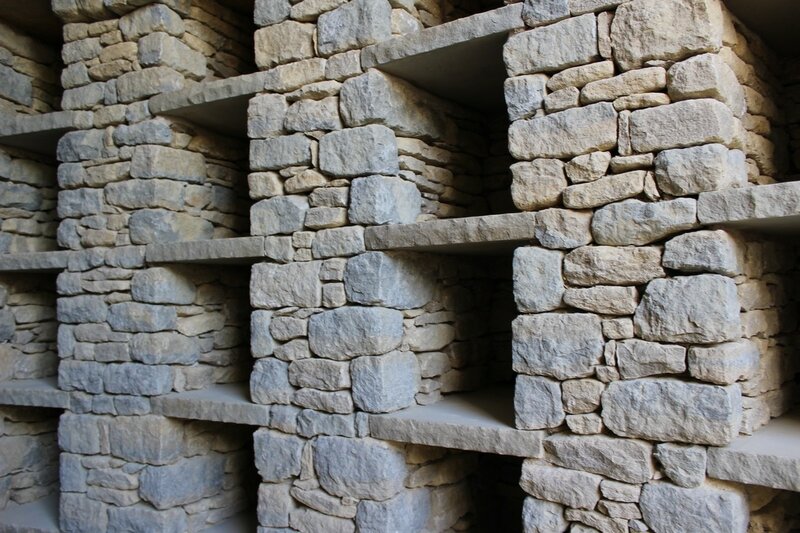 Sacred Stones’ Pinnacle award-winning stone masons have hand crafted the first round barrow in circa 3,500 years. 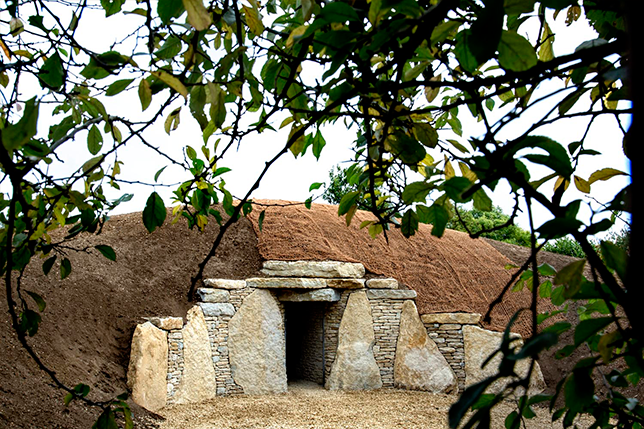 Sacred Stones have ambitions to build barrows in rural areas of Hampshire, Herefordshire, Shropshire, Buckinghamshire, Somerset, Yorkshire, Scotland and Wales. Excitingly they have just secured permission to build a round barrow in the Wye Valley Area. 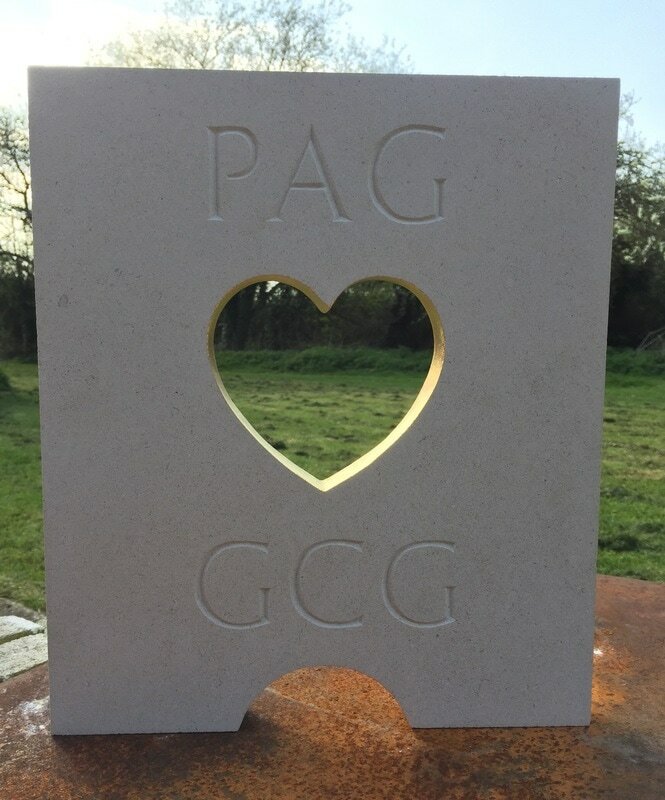 ​If you already have a niche and would like to personalise your stone façade please contact Louis here or use the contact form via the contact page. 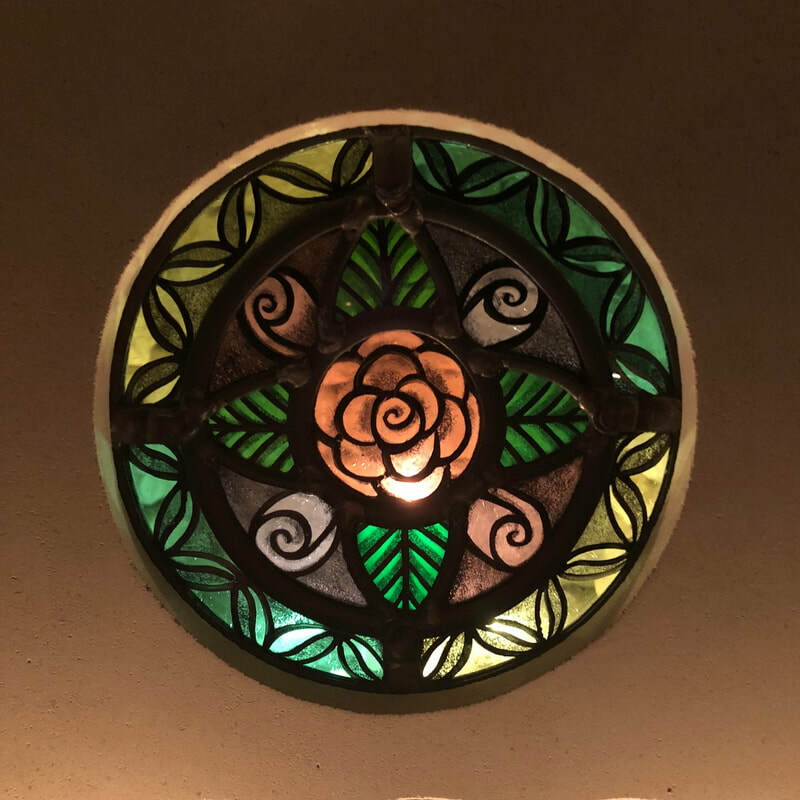 For glass and stone collaborations I work with stained glass artist Annette Jackson. For more information please visit Sacred Stones here. "I just wanted to thank you for the beautiful stone front you carved for my late husband. Many thanks for your help"
​"Last year my family lost our youngest boy, my little brother Jacob to a long battle with cancer. 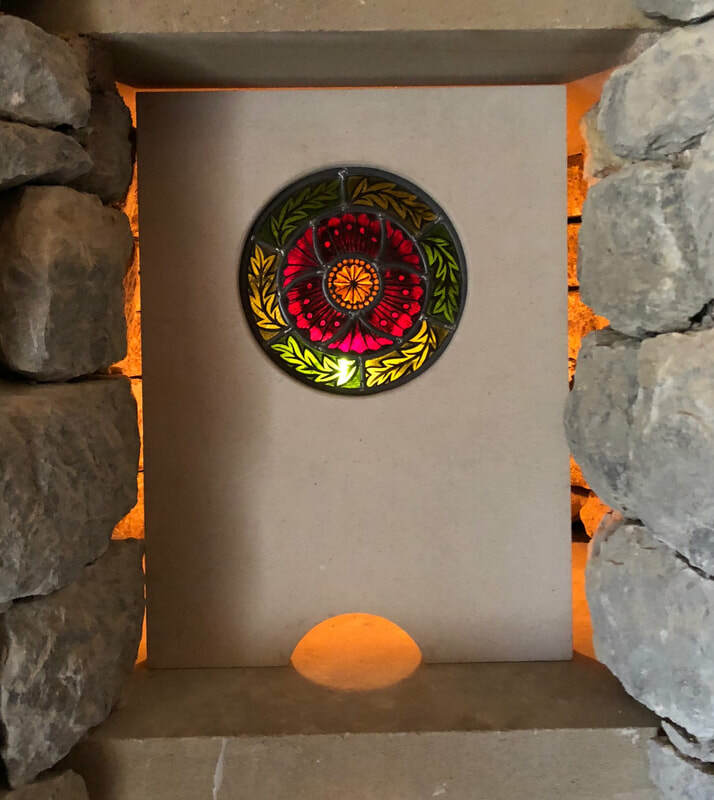 Obviously this was the most heartbreaking experience of our lives, but through Willow Barrow (where we have chosen to rest his ashes) we were able to meet Francis of ‘Francis stone design’ to create a stone carving for the front of Jacob’s Niche. We came to Francis with a strange design which perfectly suited Jacob and he had no objections whatsoever to our idea and in fact researched where we got the idea from. I had many email conversations with Francis discussing each stage of the design and process and he was very informative. Francis was warm and welcoming as soon as we met him, he is extremely professional as the same time as being kind, patient and very talented at his craft. And the best bit? The finished product is better than anything we could have imagined, it’s just stunning. 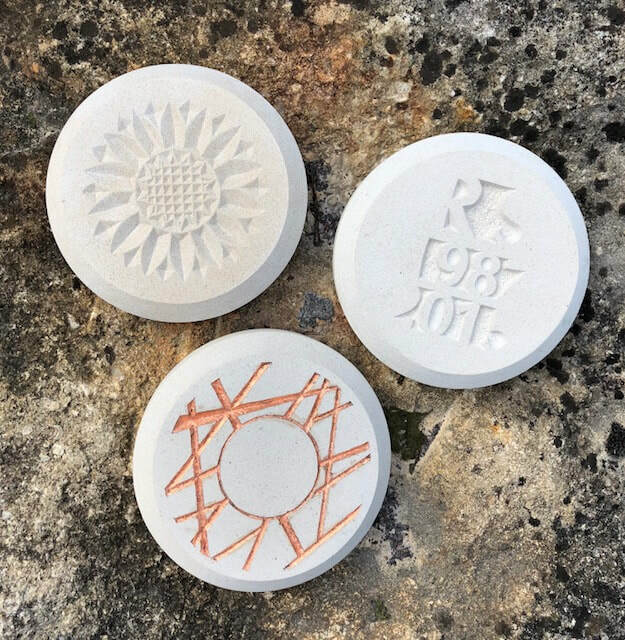 My family are over the moon with Francis and the stone he carved for Jake, and we know that wherever Jacob is now, he’s smiling at how beautiful and one of a kind it is. Thank you Francis, we will always be grateful for your dedication to your service, and your stunning work."